An aerial work platform is a mechanical device designed to provide access for equipment or people to a variety of applications at height. There are mainly two types of aerial work platforms: scissor lift and boom lift. Aerial work platforms are cost effective andeasy to use, making them the first choice ina wide range of applications such as construction, industrial and manufacturing, maintenance and repairs, etc.The global aerial work platform market is growing at an exponential rate due to increasing demand foraerial work platforms from construction industry. As a result, manufactures in the aerial work platform market are focusing on product innovation(developing technologically advanced device) in order to cater to the growing demand for aerial work platforms. Increasing demand for flexible equipment would also give rise to the need for automation so as to manage efficient operations at prescribed times.Increasing safety standards and growing adoption of aerial work platforms due to improving infrastructure are some of the key factors that are boostingthe growth of the aerial work platform market. Transparency Market Research analyses the global aerial work platform market in terms of value in US$ Mn and volume sales in terms of units. One of the major challenges affecting the growth of the aerial work platform market is its high pricing. Market introduction of scissor lifts is facing three primary challenges impeding its penetration – consumer awareness & understanding, pricing, and safety concerns. Lack of awareness could hamper the market of aerial work platforms. Further, scissor lifts with more features cost comparatively higher than conventional towers and ladders. Additionally, lack of technological advancements in countries of the Middle East & Africa will decelerate the growth of scissor lifts in the region. All these factors are expected to be restraints for the growth of the aerial work platform market. Some of the key players profiled in the global aerial work platform market are Aichi Corporation, Altec Inc., Bronto Skylift, Diversified Technologies., Haulotte Group, JLG Industries, MEC Aerial Work Platforms, Oshkosh Corporation,Palfinger AG, Skyjack (Linamar Corporation), Tadano Ltd., and Terex Corporation. The aerial work platform market report provides analysis for the period 2016–2026, wherein 2018 to 2026 is the forecast period and 2017 is the base year. The report covers all the major driving factors and key trending topics impacting the aerial work platform market growth over the forecast period. It also highlights the restraints and opportunities expected to influence the market during the aforesaid period. The study provides a comprehensive outlook on the aerial work platform market throughout the forecast period in terms of revenue (in US$ Mn) and volume (Units), across different geographies, including Asia Pacific, South America, North America, Europe, and Middle East & Africa (MEA). The report covers the entire overview of the market including the market dynamics such as drivers, restraints, opportunities, and trends that are predicted to leverage the existing nature and prospective status of this market. The relationship between diverse industries is explained under the ecosystem analysis. Furthermore, the several internal and external factors affecting the aerial work platform market are studied through the industry SWOT analysis. The competitive position of the aerial work platform market is studied through the Porter’s Five Forces Analysis. Additionally, current indicators of diverse macro-economic factors are contextualized under key market indicators. The aerial work platform market has been provided in (US$ Mn) in terms of revenue and (Units) in terms of volume, as well as the CAGR (%) for the forecast period 2018 to 2026. The aerial work platform market is a global report studied on the basis of product, end-user, structure, and region. Additionally, under the regional sections, the price trend has been incorporated to ascertain the regional impact of the same. The incremental opportunity analysis has been figured out in order to determine the most attractive segment in the upcoming years. Based on regions, the market is segmented as North America, Europe, Asia Pacific, Middle East & Africa, and South America. 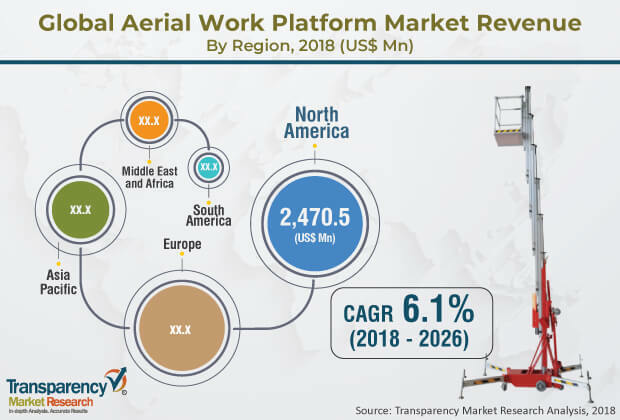 The report also highlights the competitive landscape of the aerial work platform market, thereby positioning all the major players according to their geographic presence and recent key developments. The comprehensive aerial work platform market estimates are the result of our in-depth secondary research, primary interviews, and in-house expert panel reviews. These market estimates have been analyzed by taking into account the impact of different political, social, economic, technological, and legal factors along with the current market dynamics affecting the growth of the aerial work platform market. Besides, competition matrix and market share analysis has been included under the competitive landscape to understand the top players’ contribution to the aerial work platform market. Each company is studied on the basis of basic information, financial highlights, revenue highlights of regional contribution and segment contribution, and product portfolio. Additionally, the company strategy and recent developments if any are also incorporated under each company profile section.